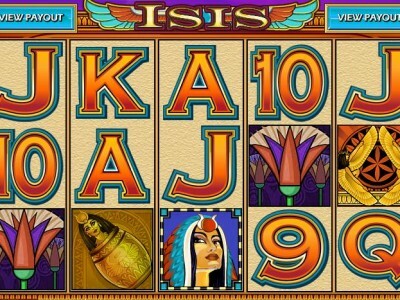 Isis is a 5 reel, 25 payline vegas style pokies finely crafted by the leading online gaming provider Microgaming. With a distinct Egyptian theme, Isis features rare Egyptian artifact symbols along with the flying eagle scatter and Egyptian Queen. Ace, King, Queen and Jack symbols also appear. The highest paying symbol is the Egyptian Queen who also acts as WILD and substitutes for all other symbols except the scatter. You can win up to 30 free spins with 6x multiplier by hitting 3 or more of the purple eagle scatter symbols. 5 scatters win 30 free spins, 4 scatters win 25 free spins and 3 scatters with 20 free spins. This is a very high paying Vegas slot machine when you can get into free spins mode. On a $2 bet it is not unusual to walk away with over $500 in winnings during the free spins. Isis slots also features a gamble function where you can easily double or quadruple your winnings and the Wild symbol also doubles wins when substituting. The maximum bet size is 0.25 per line which equates to $25 on maximum bet. The game features hand finely detailed symbols and enchanting background music to make game play enjoyable and relaxing.